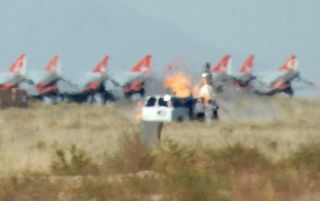 HOLLOMAN AIR FORCE BASE, New Mexico – The rocketeers at Armadillo Aerospace, thwarted by engine problems and other mechanical failures, left this year's X Prize Cup empty-handed after their spacecraft burst into flames on ignition Sunday. Over thetwo days during a Holloman Air and Space Expo, attempts at snaring the Northrop Grumman Lunar Lander Challenge's $350,000purse with their design were fraught with technical snags. At one pointon Saturday, they were within seconds of winning the money – only to have themulti-legged vehicle self-abort and tip over on landing. An attempton Sunday to hop from launch and landing pads ended with the MOD craft burstingin flames shortly after engine ignition. ArmadilloAerospace is led by computer gaming guru, John Carmack. This is the team's second attempt at the challenge in New Mexico, they were the only entrant in last year's event, which they also lost. ?From thefield, we heard a little bit of a boom and there was a hard start on the engineof some type,? said Peter Diamandis, Chairman and Chief Executive Officer ofthe X Prize Foundation. A pre-scripted scenario of dealing with the failure wasput into action. PeteWorden, a Lunar Lander Challenge judge – and director of NASA?s Ames Research Center, told SPACE.com that the engineblew up, with the rocket?s engine chamber tossing out pieces onto the pad. ?It?s overfor them for this X Prize Cup,? Worden said. But he added: ?I do think they aregetting there?it?s a robust design. I think they?ll make it. Once again, itproves that rocket science is hard.? ?Number oneis not to have any injuries or fatalities when you?re dealing with rockets. Sofrom a safety perspective, everything went by the books,? said Brett Alexander, Executive Director of Space Prizesand the X Prize Cup. Alexanderrelayed a comment from John Carmack, leader of the Armadillo team: ?Today isofficially a bad day when it comes to our vehicle.? Carmack wasnot immediately available for direct comment, but Alexander relayed that theArmadillo head rocketeer has selected not to attempt another flight latetonight. ?He made the call not to do that?he?s elected not to go forward.? The lastattempt to win the $350,000 Level 1 prize on Sunday ended when the MOD vehiclehad an engine fire, with pieces coming off, including disconnected cabling.Clearly, there was a fire on the pad that burned for a while – but then wentout. The Armadillo team called a safety emergency, requesting fire truckassistance, Alexander said. Over thetwo days of rocket shots, Carmack and his team had six flight attempts, twovery successful flights, a third one that burned for 83 seconds even with acrack in its combustion chamber. Level 1requires a rocket to take off from a designated launch area, rocket up to 150feet (50 meters) altitude, and then hover for 90 seconds while landingprecisely on a landing pad nearly 330 feet (100 meters) away. The flight mustthen be repeated in reverse - and both flights, along with all of the necessarypreparation for each, must take place within a two and a half hour period. The moredifficult Level 2 requires the rocket to hover for twice as long before landingprecisely on a simulated lunar surface, packed with craters and boulders tomimic actual lunar terrain. The hover times are calculated so that the Level 2mission closely simulates the power needed to perform a real lunar mission. ?I wouldexpect that next year there will be more than one team competing, but I don?tknow. I do know now that all $2 million is still on the table. So there?s anincentive for those that are still pushing?and an incentive for us to hold theCup and have a great event,? Alexander explained at a post-Lunar LanderChallenge press briefing.